Please Note – Payment only against credit card. Delivery time frame would be 07 – 10 working days. We thank you for your patience and understanding. 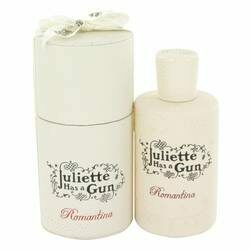 Romantina Perfume by Juliette Has A Gun, From the juliette has a gun line of fragrances, and introduced in 2011, the velvety romantina stands out as a sophisticated women’s fragrance with woody and floral accords. A delicate introductory top note of bergamot leads to a dense and vibrant heart of orange blossom and vetiver with a hint of patchouli. The scent is rounded out and balanced with base notes including an earthy musk. Romantina is an ongoing love story with romantic and sensual undertones.